The ideas for this piece have been hanging around/ being refined for a little while now. It stemmed from a painting my mother gave me some years ago. Although it was one of my favourites of her work, it had wound up in the loft and subsequently been damaged slightly. Initially, I had intended to paint over the top of it with my version of the piece creating a sort of dual work. Upon finding it was only on a paper material adhered to a mount board, I decided to start afresh on a new canvas. My final creation is not too dissimilar to the original. I tried to refine the shapes add texture and brighten the colours. In doing so I hoped to learn more about my late mother’s thinking process and what it was that I liked about the original so much. 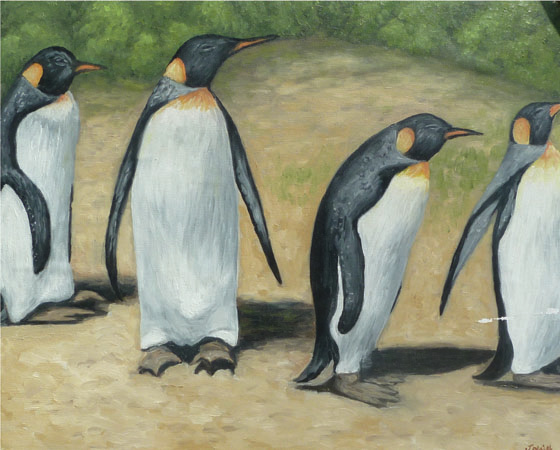 For some reason I keep coming back to the curve of the rear bush area lining up with the beak of the second penguin – a compositional choice I don’t think I’d have been brave enough to do on my own, but somehow creates a tension between second and third penguins. I also like the cheerful colours and graphic feel. I am still not sure what it is actually about, I assume it was intended as an exercise rather than a great political expression or emotional release. The creatures are presumably in a zoo, but it comes across as they are just in the wrong habitat. 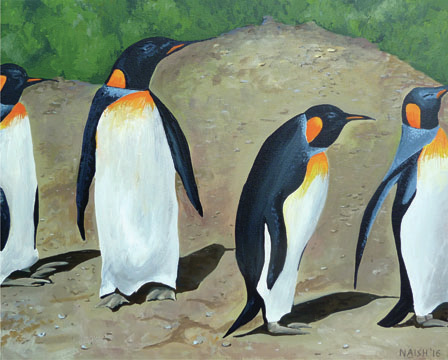 I didn’t have much source material – obviously the original painting, but also some snaps quite similar to the painting noticeably in very bright sunshine and a postcard of a penguin from Whipsnade. My intention is to use the original frame but dispose of the original painting. You can hardly accuse me of being sentimental, and why shouldn’t paintings have a conclusion as well as a life. The painting will live on in a new version, and then hopefully someone will repaint it again and through away mine. It also questions the “restoration” process: If you replace the stick and subsequently the brush of a broom is it the same broom that you started out with. Keeping just the frame in no way makes this my mum’s work. However it does keep it alive and brings it to further audience out of the shadows of my loft.